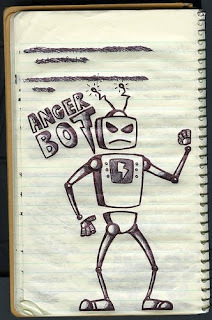 A while back, I wrote about how one of my biggest challenges as a teacher is my anger. Getting frustrated with student behavior or performance, and just....losing it. And how one of my primary goals this year was to reduce my level of anger, because, y'know, it's really not a good thing. I posted a few times about how I was doing with the situation - up and down for the most part. And then I kinda forgot about it. Well, not about the issue, per se. I forgot about the posting updates. Life. It gets busy. You know how it goes. But last week my trimester ended. And one of the things I do when trimesters end is have students complete an evaluation. (Optional) Anything else to add? It helps me figure out what's going well, what's not, what I've taught thoroughly, what I need to reteach, what I need to keep, what I need to change. I always give kids the option of filling them out anonymously, and about half of them do, though honestly I always know who wrote each (I'm weirdly good at handwriting recognition. It's odd. I don't know). I emphasize that I really want them to tell the truth because it matters to me and I use the information to drive my instruction, and they do. They're generally remarkably honest, sometimes depressingly so, but either way, helpful. Tonight I read the evaluations. And again, they were remarkably honest, occasionally depressingly so, but always helpful. But a few....a few made me cry. explaining things and being helpful. she did a good job at everything. Don't gotta answer for this one. takes time to help me when I'm stuck. I like this class better than what I had for reading and writing before. Ms. Teachin' is the first teacher that I know that doesn't scream. I'm getting better. Got a ways to go still....but I'm getting better. Good on you! Good on you for the evaluations you received -- and double good on you for giving them and reading them and changing the way you do things. I'm honestly very scared to hear what my students would say about me on this type of assessment. I don't know. It might hurt my feelings. I have anger problems too.